Bob Gorman is the managing editor of the Watertown NY Daily Times. A native of Detroit, Mich., he was graduated in 1974 from Randolph-Macon College, in Ashland, Va.
Before moving to Watertown in 1994 to become assistant managing editor for the Times, Gorman was a reporter and editor for 20 years at newspapers in South Carolina, and was named the state’s journalist of the year in 1979. He was named managing editor of the Times in 2002. 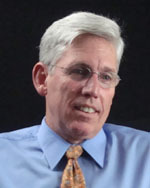 In 2001 Gorman served as president of the board of directors for the state bureaus of the Associated Press. He is also a member of the Associated Press Managing Editors Association. Bob Gorman, managing editor, The Watertown Daily Times, says the newspaper uses its website to showcase its news photography, which otherwise would not enjoy such wide exposure.